Size: 3.5cms. H/5. 25cms OD & 3.5cms ID. We are offering Wooden Napkin Rings to our client. Item Size: H-2.5", L-1.75", W-1.75"
I'm making wooden napkin ring in very best quality with full finishing and very valuable prices. It is made up of bamboo and fully made by hand. Noor International Natural Wooden Napkin Ring, Size: Dia 2"
Want to make the dinner more special for your loved ones Acquire the classy Wood Napkin Rings from our firm because apart from the delicious food, a little change in the dinning table decoration is a must to make for a special dining experience. Being the leading Wood Napkin Rings Manufacturer, Exporter and Supplier, the firm offers these at the most competitive prices. 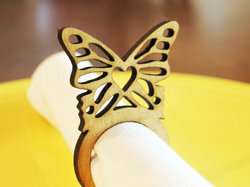 We are exporter, manufacturer and supplier of wooden polished napkin rings. Our wooden polished napkin rings is available in enchanting designs, colors and patterns that perfectly goes with the latest fashion trend. This Napkin ring is made from natural bamboo stick with hand weaving technique. It is 100% natural. We have different designs in this range. 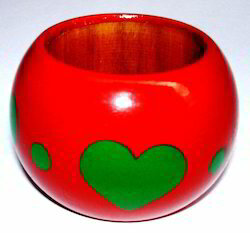 Our client can avail high quality range of Wooden Napkin Ring. Our range is specially handcrafted by our craftsmen that induce the aesthetic appeal. Our range is highly known for its durability and quality. Our range can be availed at market leading prices.